It was early in the evening on a bleak winter’s day in Amsterdam. It was next to the Stopera Music Theater. Mesmerized I stood there looking at a hodgpodge of lamps, large and small, some modern, others clearly from grandmother’s time, strait and crooked, with and without lampshade. What a crazy amalgam, I thought, just like people, bold and covered. This art project was part of the ‘Lighttour’, a route one could walk during Christmas time, the dark days from half December 2013 until the beginning of January 2014, along all kinds of artworks with light. What made this particular work so special was that it was not made by one or more artists, but by ordinary people from Amsterdam. The artists of Company New Heroes, Pascal Leboucq and Lucas De Man, only took the initiative. They had made an appeal to all the inhabitants of Amsterdam to hand in a lamp, under the motto ‘not I Amsterdam, but We’! (‘I Amsterdam’ is a slogan that is much used in Amsterdam nowadays, having its source in a big sign with these words in front of the Rijksmuseum.) 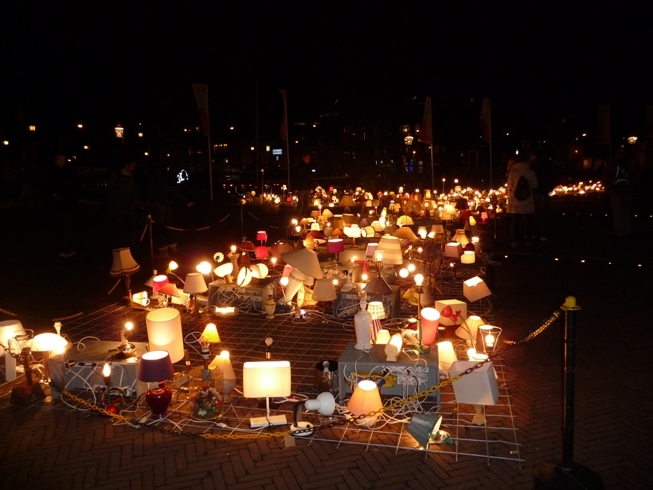 They received 1100 lamps and the result you can see in the photo: a sea of lights in the dark, involuntarily attracting a lot of people who pass by. Take a good look, maybe you see a lamp that looks like yours. I see one that resembles the table lamp of my parents. The light has gone out, which is appropriate as they have both died. But because of the light of the lamps burning around it, it does not disappear from sight. And there are more like that. Temporarily or permanently gone out they remain part of the whole of light. Once in a while the two artists come by to check the power and to see if the bulbs that have stopped burning can be revived, fulfilling the role of inspirer and healer. Next to the Stopera stood a ladder that you could climb to get a view of the lamps from above. Once there, a surprise awaited. What seemed below like a merry but unorganized caboodle of lights, formed a sentence when viewed from above that said: WE LIGHT AMSTERDAM! I thought of the well-known statement by Jesus: ‘You are the light of the world.’ This he said not only to his disciples, but to the whole crowd of people who had come to listen to him: young and old, sick and healthy, from far and nearby, indigenous and immigrants. A true mixture. He was their inspirer and healer. But they were the light! Company New Heroes: WE LIGHT AMSTERDAM, 2013/14, Lighttour Amsterdam. José Verheule is a theologian based in Zaandam, NL. She has worked as a minister in the Protestant Church in the Netherlands.